A pelisse of gros de Naples of a pomegranate-red. A full wadded rouleau finishes the skirt next the feet; over this rouleau, at a suitable distance, and down each side of the front, is a trimming, en volan, pinked at the edge, and set on in a serpentine wave; the trimming headed by a narrow rouleau. The pelisse fastens close down the front with full rosettes of gros de Naples. The body is made plain, with a narrow pelerine-cape, partially scolloped, and trimmed at the edge in a correspondent manner to the sides in front of the skirt. The sleeves are en gigot, but not very full. A falling collar of fine India muslin, trimmed with Urling's lace, encircles the throat, and is fastened in front with a rosette of broad pink ribbon. With any other red this would be incongruous, but one great quality in the beautiful and becoming pomegranate-red is, that it is suited to every colour. 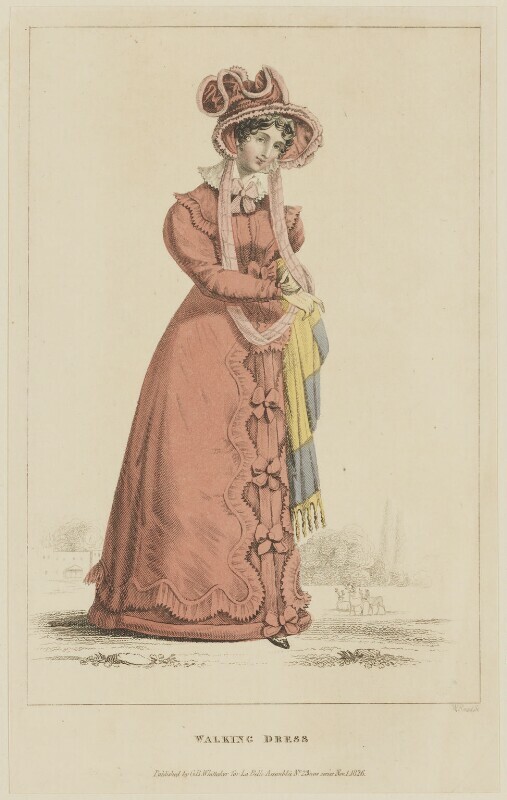 The bonnet worn with this pelisse is correspondent to it, and is finished by a narrow rûche at the edge of the brim: the trimming on the crown is of the same material, and is put on in arcades, which are edged with a narrow rûche, of a shade lighter. The strings are in a loop of ribbon, variegated with pomegranate-red and green chequers on a white ground.